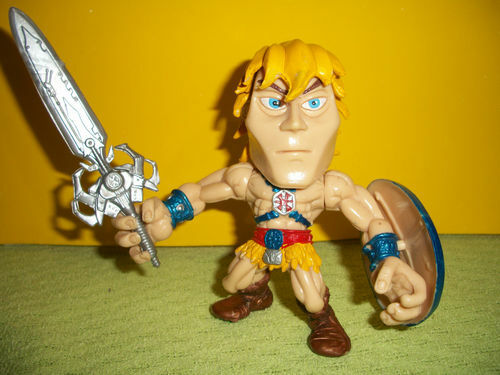 At least when it comes to actually producing super-deformed He-Man figures, rather than just taunting us with them. Thanks to @redlocust for the tip. That is pretty darn awesome. Face is a little gormless, but it’s better than nothing. Curious to see what a Skeletor looks like. Shrink the head a bit and I would buy them all. 1. These are actually available in stores. 2. I don't need a subscription to buy these. 3. The shoulders are correct. 4. The crotch will not explode. 5. This company doesn't taunt its customers by ignoring "hyper anime detail." This thing is very cool, indeed! Looks great love the face,he looks condescending like…"Why aren't you buying me right now,Matty got your peepee?" That thing is disturbing looking, but HILARIOUS too. Give that thing a proper paint job, and I would say its all kinds of awesome.